I've been wanting to say something about the sad news that motion picture film cameras are no longer being made which was quickly followed by the news that movie houses will no longer be able to project 35mm prints due to the switch to digital distribution. This change in medium has been readily apparent for quite some time. Since moving to Seattle and attending SIFF, it quickly became obvious just how many small, independent films were being shot and projected digitally. They were easy to spot due to the darker picture and lower resolution, but over time, film shot digitally became less obvious. Some of this might be due to improvements in digital technology, but I'm still skeptical. Mostly, because of my own experience with still photography. I am the proud owner of an old, Nikon 35mm film camera. It has been years since I've studied photography, but took photography in high school and again in graduate school when I realized that the darkroom was open to anyone who paid a rather small user fee and I love playing in darkrooms. So while working on my degree in Immunology, I'd occasionally shoot a few rolls of film and was delighted by the quality of the prints I was creating. And completely fell head-over-heels in love with high contrast, high resolution black and white. Like so many things, I seem to gravitate towards old fashioned, antiquated technologies and art forms. As an undergraduate, I signed up for an introductory tap dance class where I was exposed to vernacular Jazz tap from the 1930s, that was kept alive by a few dancers in the south and NYC, like Gregory Hines. The cool, relaxed quality of the movements appealed to me as well as the stark contrast to Russian Ballet, the dance form I was trained in. And as I studied Jazz Tap, I was told that it was a dead art form. This is no longer the case as Savion Glover has helped to re-popularize the modernize the form, but in the early 90s, popular opinion was that jazz and rhythm tap was a historical dance form and I cannot help but think that may have been some of the appeal. I also gravitate toward clothing of past eras. I think the clothing of the 30s and 40s is sexier and more flattering to women, than today's styles. I also have a thing for 1970s, UK glam rock and don't listen to current music. And while I have a kindle, I still prefer books on paper and even would like to learn calligraphy as I am also saddened by the loss of handwriting. But when it comes to my reaction toward digital images, I simply do not believe they are better then film. When 35mm film became harder to find, I looked into transitioning to digital photography. It seemed so much cheaper and easier as one doesn't have to buy film, pay for developing, or need access to a darkroom. And it seems greener as all of those film processing chemicals must be a nightmare to dispose of properly. But when I actually looked at the cameras and at examples of impressive black and white photography, I noticed that photographers were still using film cameras. And digital cameras are very expensive. To achieve the same resolution that I get with my camera, I would have to spend several thousand dollars on a camera, that will probably be obsolete in a few years. What was immediately clear was that due to the differences in optics between an old 35mm SLR camera and a new digital SLR, when shooting in black and white, film looks better. And due to this, I doubt that cinema shot with a digital camera and projected digitally will ever look as good as film. Although, I am seeing examples of some great looking cinema that was shot with digital cameras. One of the reasons I'm so crazy about Nicolas Winding Refn is the look of his films. I missed seeing Valhalla Rising on the big screen, but was completely blown away by the cinematography when I caught up with it at home. 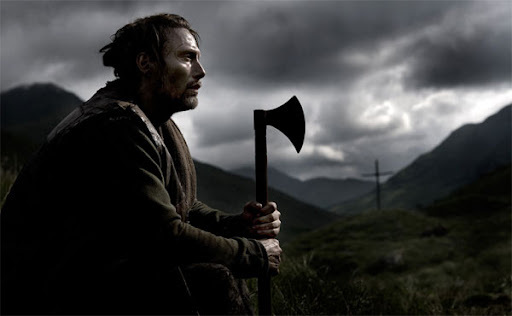 Valhalla Rising looks like the kind of film that couldn't have been made with a digital motion picture camera, but IMDB technical specifications state that it was shot with a Red One Camera and transferred to 35mm film. Additionally, being a long time fan of Robert Rodriguez, he has illustrated just how powerful the digital medium can be, if you've seen his 10 Minute Film School series or looked at what he achieved with Sin City. And shooting in digital is significantly cheaper then working with film, allowing anyone with a cell phone to make a movie, as Park Chan-wook proved with Night Fishing. I even bought an inexpensive digital video camera to play with, but sadly, my health has been poor and I haven't had the energy to figure out editing software. So I'm grieving the changes going on in cinema, but see advantages to the evolution of the art form. I still believe I can tell the difference between film and a digital print, but maybe one day, I won't be able to. 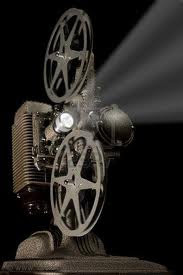 But while I'm resigned to the fact that more films are shot with digital cameras, I'm still saddened by the news that in the near future, very few theaters will be projecting film prints. I still see the cigarette burns that indicate reel changes on most of the films that I see in the cinema, but for how much longer? 35mm Projection is at Risk. Does That Matter?